5.0 x 3.7 x 5.1 in. Fujifilm's FinePix S9100 couples a powerful 10.7x optical zoom lens which can focus down to just 0.4 inches, with a 1/1.6 inch nine-megapixel Super CCD HR imager that yields a maximum ISO rating of 1,600. Like its predecessor, the S9000, the Fujifilm S9100 has the same overall body design, dual media slots (CompactFlash / Microdrive, and xD-Picture Card), and an electronic viewfinder that can offer frame rates of either 30 or 60 frames per second. There's plenty in the Fuji FinePix S9100 to handle the needs of advanced amateurs looking for maximum control over their photos, with PASM exposure modes, a Raw file format, auto/manual focus, three metering modes, nine white balance modes (including two custom hold modes), a six-mode popup flash, plus a choice of external flash hot shoe and a PC sync connector. Changes from the S9000 to the Fuji S9100 include a slightly larger 2-inch LCD display with double the resolution at 235,000 pixels (which also makes the camera just a scant three grams heavier); the i-Flash metering functionality we've seen previously on the FinePix F30 and S6000fd models; improved autofocus performance; new image processing algorithms that are said to offer better resolution and sharpness; and the addition of Fujifilm's Hyper Utility Software HS-V2 (version 3) to the product bundle. Showing the difference a year can make, the Fujifilm FinePix S9100 is priced $100 below the original price of the model it replaces, shipping September 2006 for U.S. $599. Intro. Fujifilm still insists that silver halide delivers the highest quality image, so it isn't a surprise that the company hasn't abandoned what it calls its "serious" line of digicams instead of developing an affordable digital SLR. The Serious cameras complement the point-and-shoot Sensible digicams, the subcompact Smart digicams, the Stylish ultracompacts, and the Sophisticated E900. Big Glass. Shoot from 28-300mm optically, and double that with a very competent digital zoom. And they distinguish themselves from all the others by looking like, well, a camera. The S9100 is an all-in-one digicam, not a dSLR. As such, it has a live, articulated 2.0-inch LCD and Movie mode. But it has the feel of a small dSLR from the way you grip it to how you operate the zoom. It's an engaging design with all the control you expect from its hearty appearance. Since you can't change the lens, Fujifilm gives you one great one, ranging from 28 to 300mm in 35mm equivalent with a Super Macro setting that focuses as close as 0.4 inches from the front element at wide-angle. At 28mm it's a pretty fast lens, too, opening up to f/2.8. Even at 300mm, it manages f/4.9. And what that lens sees is captured on a Super CCD sensor with 9.0 effective megapixels, and sensitivity ranging from ISO 80 to 1,600. Hot Shoe. There's also a PC sync connection on the front. 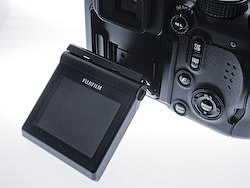 Fujifilm takes flash seriously, too, offering a hotshoe and PC sync terminal for external flash, and building in its intelligent flash system that can adjust flash power depending on focus data. But what sold me on this unit was its natural light performance. On the Mode dial there's a Natural Light setting that adjusts ISO without tapping into flash to capture whatever light falls on your scene. The gallery shots give you an idea what I was able to do, but not the whole picture. Shutter speeds ranged from 1/4 to 1/4,000 second, and ISO topped out at a very usable 800. I don't know how it did it without image stabilization, but our shots were pretty sharp. There is an Anti-shake mode, but it simply chooses a higher shutter speed. Maybe the secret is in just how easy it is to handle the S9100. This responsive and flexible camera will be treasured by photo buffs, but it won't intimidate people new to the game who want a camera that can take those great pictures they see others getting. Design. The popularity of the flat, compact digicam with the compact lens and the quickly dropping prices of entry-level dSLRs has squeezed the EVF digicam nearly out of the market. They aren't as inexpensive as a subcompact nor quite as good (with their smaller sensors) as a dSLR, but Fujifilm continues to add value to this species. 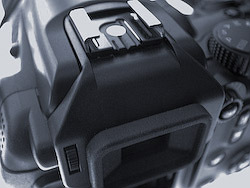 EVF cameras do offer more engaging operation than a subcompact. They also deliver a live LCD, a live histogram, and a Movie mode, something missing on most dSLRs. Controls. 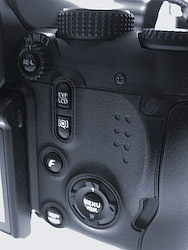 Not many buttons on the back, but three sides of the camera have controls. One secret to its low light performance may be its weight. It feels light, but it's actually 1.75 pounds; heavy in the prosumer/long zoom category. But that weight is meant to be handled by both hands. Your right hand grips the battery chamber, and your left composes the image by turning the zoom ring on the lens. To follow the action, you have your choice of using the EVF like a dSLR, or the articulated 2-inch LCD with 235,000 pixels for excellent detail. The LCD can flip up, locking into a 90 degree up-angle; then it pulls out, providing a 45 degree upward angle, and finally flips back, providing a 45 degree downward angle for easier overhead shots. When you power the S9100 on, you select Record or Playback mode. So you only have to select your shooting mode from the Mode dial. Movie, and several Scene modes are there, as you might expect, but so are Manual, Shutter Priority, Aperture Priority, Programmed Auto, and Auto. Two Scene modes are worth pointing out: Anti-shake and Natural Light, which I'll talk about shortly. 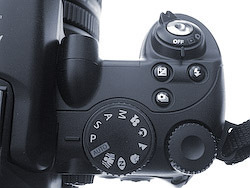 Controls are mostly button-based, with Exposure Compensation, Flash modes, and Drive settings near the Mode dial on top, and EVF/LCD, Exposure Lock, Magnify, Menu, FinePix, Display/Back buttons on the back, and a third set of buttons on the side by the lens that control Info display, Focus options, and Macro modes. The triple grouping makes sense, and avoids trips to the LCD menu, as well as repetitive scrolling; though it does seem a little odd to have the Info button on the left side of the camera instead of next to the LCD. Top. Controls on the top are easy to use and remember. 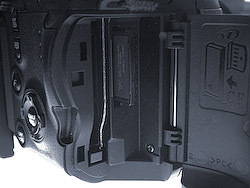 The S9100 also has two card slots. One for xD Picture Cards, and another for CompactFlash. You can set the slot you want to use first if you populate both, otherwise the camera uses the slot you've put a card in. Display/Viewfinder. The S9100 gives you two viewfinder options. You can elect to use the electronic viewfinder, a necessity for any long zoom where at telephoto focal lengths the optical display would be too dim to see clearly. If you do, you can adjust its focus with the dioptric adjustment so you can use it with your glasses. LCD. Hinged at the bottom to the camera, and at the top to an extender you can flip it up 90 degrees, out 45 degrees up (as shown), and back under the extender for 45 degrees down-angle. Though its only slightly larger than the S9000, what's best about the 2-inch LCD is its higher resolution. It's hinged to the camera back so you can compose your image easily even if you hold the camera above your head or below your belt. I took advantage of this on almost every shot, slightly moving the LCD away from the S9100's back, and flipping it all the way out. Performance. Both power-on and shutdown were quick and convenient enough that I didn't bother to let the S9100 time out. I just flicked it on or off. No lens has to extend, no logo splashes on the LCD, the S9100 just snaps into action. It's how all cameras should be. You can't have a better zoom mechanism. 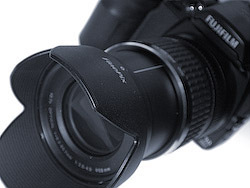 You simply twist the large knurled ring on the front of the lens. It's smooth, not stepped, and you have complete control. Why aren't all zooms like this? Card Compartment. The S9100 handles both xD Picture Cards (inserted), and CompactFlash. xD Cards were faster. Once you've picked a shooting mode, you can adjust whatever is adjustable about it with the adjacent command wheel. In Shutter Priority, you just spin the wheel to set a different shutter speed. In Aperture Priority, spin the wheel for a different aperture. In Manual mode, where you have to adjust both, the wheel handles shutter speed, and holding the Exposure Compensation button down while spinning the wheel adjusts aperture. The wheel's a little stiff, but at this price you can't complain. Shutter lag seemed non-existent, and shot-to-shot time was snappy, too. Just as they should be on any camera. USB. 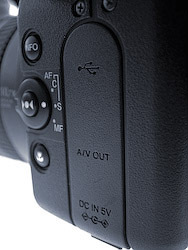 The left side of the camera with controls (mainly for focusing) also hosts the AV/USB ports. And you do have two interesting Continuous shooting choices for capture that record the first four, or last four images in a sequence at a 1.5 fps clip. Image quality was a mixed bag, unfortunately. Most of the shots I took were a pleasure to review both on the LCD, and later on the computer. But the S9100 has a tendency to lose highlight detail in shots taken in full sunlight. If you're shooting in full sun, use Exposure Compensation to protect your highlights. Turn on the live histogram display to see what's going on. But for shots taken in the shade, images were just gorgeous, with good detail and smooth tonality. If they gave awards for histograms, the S91000 would have a shelf of trophies. Color was true and natural, avoiding the oversaturation so common on digicams. Another cure for blown highlights is to shoot in the S9100's Raw mode, creating an 18.93MB RAF file (which converts to a compressed but lossless DNG of about 12.4MB or less). I didn't have any trouble viewing the RAF file format thumbnails in iView MediaPro, and Adobe Camera Raw handled them easily, too. I was able to recover highlight detail easily when I shot Raw. You don't often see Raw capture as an option in a digicam (even less so these days), so outright prolonged applause to Fujifilm for putting it in the S9100. It's another illustration of how far the S9100 can take your photography. A real surprise was the Natural Light mode. I took a number of shots in the de Young museum where I have taken a number of shots with a number of cameras before. But this time I got results I could print at 13 x 19. More on that below. And just as surprising was the intelligent flash. I tried to blow out my face, shooting in Macro with the flash at arms length, and the S9100 just wouldn't do it. It lit up my face naturally, while capturing the background as well. Not blowing out foreground subjects is something every flash should know how to do, but the S9100, using focus data, is smart enough to do it. Movies. With sound -- and no zoom motor noise (13.4MB download). The S9100's Movie mode records MPEG with audio in an AVI format at either 640 x 480, or 320 x 240 pixel resolution, both at 30 fps. And you can zoom (silently since no motor is involved) while filming. You start recording by fully depressing the Shutter button, as on most cameras. But to stop recording, you only half depress it. That's a little confusing. I tended to fully depress it, confusing myself about whether, or not I'd actually stopped recording (and explaining the hitch at the end of the movie sample). But I liked the results. True Wide-angle. A full 28mm equivalent. Full Optical Zoom. A 300mm equivalent. The S9100 uses four AA batteries. We used 2300 mAh NiMH rechargeables, and never drained them in one shoot. Shooting. Of all the possible shapes a digital camera can take, this is the one I prefer. It's larger, yet it isn't so large you'll have to pack it around in its own luggage, like many dSLRs. You can just hang it on your shoulder where it will be ready for action when you are. Or use a wrist strap to keep it handy. The real pleasure of this shape is when you get your hand around the grip and your fingers on the zoom ring. You're engaged. You're part of the camera. There's nothing like it. With a 10.7x zoom that starts at 28mm, you've got quite a range to play with. Our zoom range shot takes in quite a bit more of the stone wall than usual. You can double the zoom range by pressing the Up arrow to engage digital zoom. Pressing the Down arrow cancels it. In the Shade. With -0.7 EV. Inspired by that generous zoom range, I took the S9100 on several excursions, both outdoors and indoors. Interestingly, the outdoor shots were almost all captured at ISO 80, and the indoor shots (without flash) at ISO 800. And to do that in Programmed Auto and Auto modes, the aperture was set as wide open as the focal length permitted. That resulted in images that were a bit softer than they might have been, unfortunately. To be fair, I recalibrated my expectations by viewing the Panasonic Lumix FZ50's high resolution images. That Leica lens, with Panasonic's edge enhancement on its 10 megapixel images, really didn't do any better. Let's take a look at what a few of my favorite images from those shoots tell us about the S9100. I had to reshoot my usual zoom range images because it simply didn't occur to me that a mechanical zoom ring could have digital zoom, too. Obviously, I didn't have the pleasure of reviewing the S9000 a year ago. I don't bring a tripod with me when I shoot those images, but I do have a nice sturdy post abandoned by a malfunctioning scope. So these images profit from not being handheld. The range from 28mm to 600mm is astounding. Forgive the haze in the image at that distance. Instead, compare the shot of the worker on Sutro Tower shot at the full optical/digital zoom of 600mm. 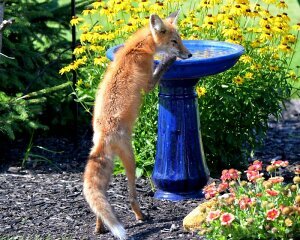 The S9100 does digital zoom very well -- without dropping the image size, either. Handheld, full optical zoom was a lot of fun, too, especially when Anti-shake mode was employed as a little insurance. My shot of City Hall's dome was really impossible to frame. I led the image as if the dome were a duck taking flight. At f7.1, it's as sharp as the S9100 gets, which isn't bad. But that's stunt photography. What really won me over was going indoors, and shooting natural light scenes that most cameras just can't touch. The first such shot you'll see in the gallery is a pair of salt and pepper shakers beyond a pair of glasses. There's some blooming on the silver shaker tops, and a very shallow depth of field (the glasses in the foreground aren't really in focus) but the image represents the scene perfectly in tone, and color. Natural Light. Since CES, Macworld, and PMA, chairs have been on my mind. That was very exciting but even more impressive were the shots I got at the de Young museum. It seems to me that the lighting in the new de Young is a good bit lower than it was in the old museum. Great for the paintings but tough for photographers. The rules state that you can take shots of the permanent collection but you can't use flash or a tripod. In fact, the day we were there, we walked past a sentry post that had a very nice tripod resting on top of it along with a Nikon lens cap, and a polarizing filter. Apparently this unlucky shooter would get his tripod back after class. So what's a person to do? Well, many cameras offer a scene mode designed for low light situations. The flash is disabled, ISO is raised, and, if you're lucky, some minimum handheld shutter speed is enforced. There are other strategies, too, like Nikon's BSS mode, which takes several shots, and saves the image with the most detail. But none of these works reliably in museum settings. Natural Light. ISO 800 at 1/40 sec. So I've been taking digicams into the museums here since 1998 trying to get good shots of my favorite paintings. Once in a while I exhale at the right time, and get a reasonably sharp image. But for the most part, I'm reduced to printing these at very small sizes (4x6, and smaller). The gallery shows only a glimpse of what can be done with the S9100 in a museum. The rules prevent me from reproducing the works in whole, but my atmospheric and detail shots are permissible. What you'll see is rather typical exposures. Which is remarkable. I used the Natural Light scene mode, which set shutter speeds as low as 1/4 and typically 1/40 second and under. Hardly the 1/60 second handheld standard. ISO was punched up to 800, introducing some noise (as you can see in our Test Results section below). I was able to print these images (and that includes reproductions of paintings) at 13 x 19. I did run them through Imagenomic's Noiseware plug-in to mute the noise, but these prints were the best I've gotten from a digicam in those conditions. Finally, I took a few macro shots. Macro is one of digital photography's biggest bonuses, and the S9100 didn't disappoint. Here you see a shot of a rusty latch and another of some European currency, both shot in Super Macro mode, which lets you sneak the lens within half an inch of the subject at wide-angle -- with the dramatic distortion that focal length provides. Curiosity got the better of me, and, even though I'm no fan of on-camera flash, I tried a few tests of the i-Flash intelligent flash system. i-Flash, which uses focus data to avoid burning out a foreground subject, surprised me. It worked very well, producing results superior to the typical flash shot on a compact digicam. If you have to shoot flash a lot and are unhappy with what you're getting now, this is a step up. A further step up, of course, is moving the flash off the camera, even though TTL flash metering isn't active. The S9100 gives you two ways to do that. You can use the hot shoe to mount a sensor attached to an external flash (or simply mount an external flash to the shoe). You can connect an external flash with the PC sync cord. Either approach lets you move the light off the camera. Appraisal. Designed for the person who wants to take pictures instead of snapshots, the Fujifilm S9100 provides every tool for the job except image stabilization, which would certainly make this bargain more expensive. It's a pleasure to handle, relying on three sets of well-laid-out buttons to set its controls. And the images it captures in available light may just make you ignore its intelligent flash. 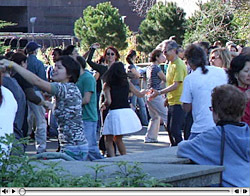 I had a lot of fun shooting with the S9100. All it lacks is optical image stabilization. That may seem like a big omission these days, but the S9100 does surprisingly well without it, capturing usable images with a handheld shutter speed as low as 1/5 second. The lack of optical image stabilization does make the S9100 a very affordable long zoom, and it won't disappoint anyone who wants to learn how to take great pictures. All the controls are there, most of them just a button away. I needed Exposure Compensation to hang on to my highlight detail in full sun, but otherwise, Programmed Auto, and Auto mode delivered natural color that was not oversaturated. Most impressive was Natural Light mode, which made it possible to get some great shots of a few favorite canvases at the local museum. Also worth noting is the intelligent flash, which performed much better than most digicam flash guns. Not much has changed since Dave recommended the S9000 as "a great choice for enthusiast photographers on a budget." The S9100 remains a Dave's Pick for its excellent build, smooth operation, rich feature set, and great price. With a larger LCD, iFlash and improved image processing, the S9100 just improves on a real winner that can bring home great pictures.